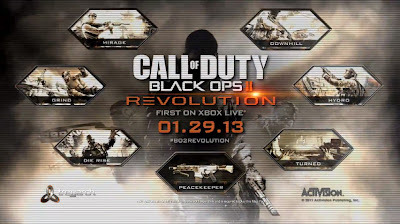 Activision recently announced that the Call Of Duty: Black Ops II Revolution DLC Map Pack will be available for PlayStation 3 and PC fans on February 28th! Located in Pakistan, this hydro-electric plant comes complete with a lethal spillway that floods with very little warning. Set in a skate park in Venice Beach (the birthplace of skateboarding! ), quarter-pipes and curved surfaces drive players away from easy cover and into intense firefights. A ski resort in the French Alps, this snowy map is complete with a moving gondola system that can both offer cover and crush you to death. Located in China’s Gobi Desert, this luxury resort has been ravaged by a sandstorm. 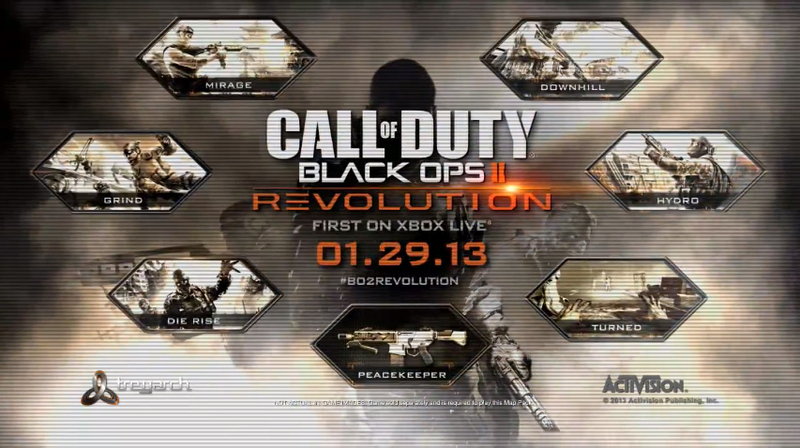 Zombies fans get a terrifying double-dose of undead action in Revolution. First, the new map, “Die Rise,” drops players inside a maze of crumbling skyscrapers amidst a ravaged Chinese city, where all-new Wonder Weaponry will play a crucial role as they make a valiant stand against the impending zombie hoard. Additionally, Revolution’s new Zombies mode, “Turned,” flips this new fan-favourite mode around, allowing players to become the undead and play as a zombie, offering an entirely new style of bragging rights.